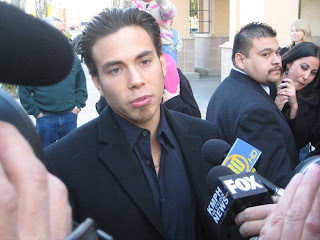 Apolo Ohno is the co-founder and formulator of 8zone, a dietary supplement company. But he is best known for being the most decorated American Winter Olympic athlete of all time. Monday in Fresno, he was known for his new book, Zero Regrets: Be Greater Than Yesterday. The face of short track speed skating worldwide was greeted by hundreds of fans waiting to catch a glimpse of their favorite U.S. Olympian and have their book autographed. Ohno talking to Fresno media while on tour to promote his new book. Ohno was on the 16th stop of his book signing bus tour that when it ends on December 4, will have covered 34 cities in nine days. “I’ve been living on that bus,” Ohno told Fresno media. A bus that is adorned with Ohno’s book cover and picture of him doing what he likes to – skate. 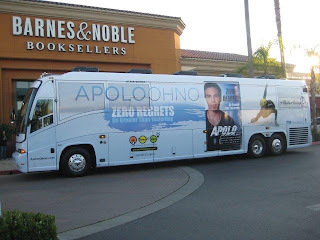 Ohno's touring book bus in Fresno. Ohno redefined the sport of short track speed skating starting in 1999, when he became the youngest athlete ever to win a World Cup event title. He won the overall World Championship in 2008, the World Cup Overall title in 2001, 2003, and 2005, and the men’s national title 12 times. He has won eight Olympic medals and 23 World Championship medals. In October 2003 and March 2008 he was the United States Olympic Committee’s Male Athlete of the Month. In 2007, he was also the winner of the fourth season of the popular ABC-TV television show, Dancing with the Stars. In Zero Regrets, Ohno shares his moving personal story behind his great success, as well as the hard-won truths and strategies he has discovered in good times and bad. The book is much more than an account of racing competition. Zero Regrets is a captivating story of a father-and-son relationship that expanded over time and based on respect, love and unwavering faith in each other. 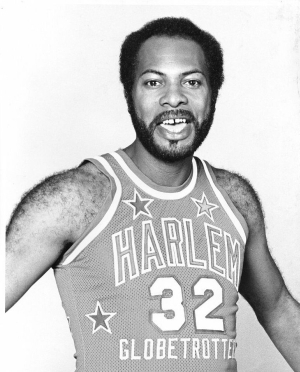 Nate Branch, former Harlem Globetrotters will make a guest appearance on Baker: In the City, the Internet television show on CentralValleyTalk.com, Tuesday, December 7. The live phone-in interview takes place from 1-2 p.m. Pacific. Baker: In the City is hosted by Sheldon Baker, NutraInk.com publisher. Branch attended Nebraska University and began playing with the Harlem Globetrotters in 1967. He recalled that his starting salary in 1967 was $20,000, which is quite different from present day contracts. He has been around the world six times and Branch will discuss the many memories that stand out for him. Branch, a Palo Alto, CA resident is the musical director at his local church. He also plays four instruments, including piano. Nate Branch at the piano. “My purpose is to inspire to know life can be good. You can always inspire to be better. If I can reach one kid, I have reached my goal to learn all you can at any age,” he says with a smile. What's a good way to give thanks on Thanksgiving? Let them eat cake! Take flour, sugar, bananas, eggs and traditional spices provided by Baker Dillon Group, Starbucks and Rodeo Coffee Shop of Clovis and AlphaGraphics of Fresno, and in the better part of a day you've got about three dozen banana cakes for the Fresno-based Poverello House, a private, non-profit, nondenominational organization that has been serving the hungry, homeless and destitute for 37 years. With the continuing support of the community, through volunteers and donations, Poverello House now serves approximately 1,250-1,400 meals a day, 365 days a year. Levi of Poverello House helps unload the banana cakes early Thanksgiving morning. The cake making idea was the brainchild of Sheldon Baker (NutraInk.com publisher and editor) and Karena Dillon, principals of Baker Dillon Group, the Clovis, CA-based brand marketing, advertising and public relations firm. "We didn't have plans for Thanksgiving and we thought about how we could provide a service to the community," Baker said. "This seemed like the perfect way." Baker first approached John Sanders, California Central Valley district manager for Starbucks about contributing bananas. Sanders requested one of the Clovis stores order extra bananas that could be used for the project. Eggs were donated by Rodeo Coffee Shop in Old Town Clovis, cake mixes from AlphaGraphics in Fresno and the other condiments and making coordination by Baker Dillon Group. Dillon, who often makes cakes for her firm's vendors, is rolling up her sleeves and preparing all the cakes over a 24-hour period and will deliver them Thanksgiving morning. "Poverello House was delighted to receive this dessert donation which they said would be used throughout the Thanksgiving weekend," said Dillon. "We just decided to do this a few days ago and we didn't have a lot of time to gather the ingredients," Baker said. "but all the organizations we contacted were more than willing to ante up the baking supplies." In 1973, Poverello House founder Mike McGarvin began offering peanut butter and jelly sandwiches to the homeless and hungry community. Through the years, inspired by his example, others began to lend a hand. "We're already thinking about next year and with an earlier start and more preparation we might make peanut butter and jelly cupcakes and cookies," said Dillon. Other Poverello House services include free medical and dental care through the Holy Cross Clinic; showers and laundry services to the homeless; a day shelter for people on the streets; a safe, overnight shelter for women at Naomi's House; temporary shelter for 44 individuals at the Village of Hope; a 28-bed residential alcohol and drug rehabilitation program; a five-bed transitional home; free clothing, mail service, transportation, referral services and other various social services, as well as a homeless dog kennel for abandoned pets. Poverello House is located at 412 F Street in Fresno. 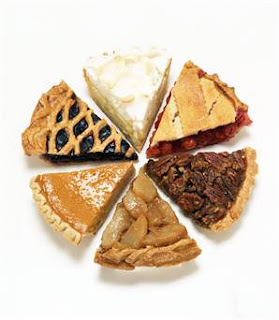 (ARA) - Pie, cookies, peppermint - you name the sweet, and it's surely no stranger to the holiday season. For many, this time of year means extra indulgence and, consequentially, extra inches added to the waistline. You may be surprised to learn, though, that you can enjoy holiday goodies in a healthy way by incorporating ingredients like dried fruit, nuts and whole grains. * Try using whole wheat flour. Whole wheat adds both fiber and magnesium to your diet. * Add sweetness and texture with dried fruits. Try mixing in a dried fruit blend for both great flavor and added nutrition. * Go nuts. Nuts, such as almonds, walnuts and pistachios, are a heart-healthy addition to holiday baking. * Substitute fruit purees for oil or butter. Pureed prunes make a great swap for fat-laden oils. * Glaze, don't frost. A simple glaze can be the sweet topper to a delicious dessert and will save nearly double digits in fat grams over butter-rich frostings. To get started, serve up this new, healthy holiday classic for brunch, incorporating nutrient-rich dried fruits for added flavor and nutritional value. Try adding Sunsweet Antioxidant Blend, a delicious mix of dried blueberries, red tart cherries, cranberries and plums, delivering important vitamins and minerals at only 130 calories per serving. This holiday season, join Sunsweet and Recipe For Togetherness in the Play Scratch, Bake & Win! contest where you can win one of several pre-paid debit cards. For more healthy recipes, visit www.Sunsweet.com. Combine whole wheat flour, undissolved yeast, sugar and salt in a large mixer bowl. Heat milk and butter until very warm (120 to 130 F). Add to flour mixture with eggs and beat on medium speed with electric mixer until smooth and elastic, about three minutes. Gradually stir in all-purpose flour. Add dried fruit, chocolate and nuts (if desired). Spread batter in two greased 8 1/2 by 4 1/2 inch loaf pans, filling each half full. Let rise in a warm, draft-free place until nearly doubled, about 45 to 60 minutes. Bake in preheated 325 F oven for 35 to 40 minutes or until golden brown. Cool for 10 minutes and remove from pan. Cool 20 minutes on wire rack. While the bread is cooling, prepare glaze by combining powdered sugar and vanilla extract and mix until smooth. Pour glaze over top of each loaf and continue to cool. Serve at room temperature. According to the Centers for Disease Control (CDC), there are over 23 million diabetics in the U.S., and another 40 million people with pre-diabetes and other blood sugar issues. The CDC projects that 1 in 3 people could have diabetes by the year 2050. Jeff Cohen has been a diabetic since 1993. He was frustrated while trying to find a snack that didn’t cause a blood sugar spike and also tasted good. He finally decided to create his own, and his company Granola Gourmet was born to solve the problem. From humble beginnings in his family kitchen, the meal replacement bars were made in small batches using organic ingredients and became a weekly family tradition. His teenage boys began getting requests for new flavors from their friends. The cast and crew of Hollywood television shows from The Ellen Show, The Mentalist, Entourage and others on the Warner Bros. lot and CBS-TV began buying the bars. Soon they became the healthiest product on the Craft Services table catering to the motion picture industry. And Granola Gourmet became a local family-owned business success. Cohen’s company has just introduced what it calls its Ultimate line of individually wrapped energy bars replying to consumer and grocer requests for natural portable snack items. The individually wrapped bars also respond to consumer demand for 100% natural grab-and-go snacks that don’t spike blood sugar. Made entirely in the U.S., the bars come in four flavors. According to Cohen, as demand for diabetic food items becomes mainstream, many national retail and grocery store chains are expanding their healthy and natural product lines. “While Granola Gourmet Ultimate Energy Bars are designed to satisfy your sweet tooth, the bars do not have refined sugar or the fat and sodium content of other popular protein and energy bars in its formulation,” explains Cohen. But is healthy food too expensive? “Not anymore,” says Cohen. “Organic ingredients have come way down in price. We are seeing small differences in the cost of many of the organic ingredients we acquire today. In our case, you'll find our energy bar products priced the same or less than many of the bars that are not healthy,” Cohen notes. This is the first time consumers will have the opportunity to purchase Granola Gourmet’s individually wrapped bars or in a caddy of 10. Ultimate Berry with blueberries, Ultimate Fudge Brownie with a nutty texture, Ultimate Mocha Fudge with a chocolaty base and touch of coffee flavor and aroma and Ultimate Cran-Orange make up the Ultimate selection. 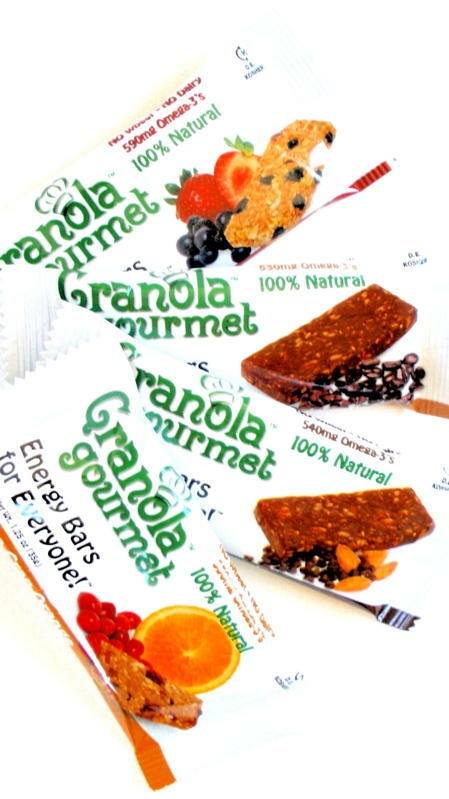 Granola Gourmet bars contains 10-12g whole grains and 530-590mg of omega-3. For those with other dietary requirements, the bars are free of wheat and dairy, low in sodium, and are kosher and vegan.  Santa Clarita, CA-based Granola Gourmet also uses Low Glycemic Index ingredients. Low Glycemic foods provide longer periods of sustained energy, hunger relief and reduces the risk of experiencing blood sugar spikes. As a result, Granola Gourmet bars convert to sugar more slowly. In Northern California, Safeway and Vons are carrying the products. The nationwide grocery chain launch is supported by a giveaway rebate offer that enables customers to receive free Granola Gourmet Energy Bars in exchange for proof of purchase. For more information about Granola Gourmet visit www.granolagourmet.com. In a sea of energy bars, customers have found Granola Gourmet products are 100% natural and formulated with several organic ingredients. “When I think about our brand two words come to mind, healthy and delicious,” says Cohen. “When Whole Foods in Southern California began carrying our product line I knew we had something and decided to put extra effort into the business. Today, we are expanding and excited about the future,” Cohen says, with a big smile. 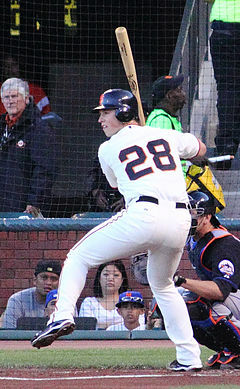 San Francisco Giants catcher Buster Posey, was named the winner of the National League Rookie of the Year Award on Monday. Posey, 23, the Giants' first-round draft pick in 2008, began the 2010 season with the Triple-A Fresno Grizzlies where hit .349 with six homers in the first 47 games of the season in the Minors before being called to the Giants May 29. Visit the November 11 post on NutraInk.com and listen to the interview conducted with Posey on April 6 while he was still a member of the Fresno Grizzlies. On April 6, 2010, the San Francisco Giants announced the Opening Day roster for the 2010 Fresno Grizzlies, their Triple A minor league affiliate. Headlining the list of top prospects were Buster Posey and Madison Bumgarner. Both were the top two prospects in the Giants’ minor league system, according to Baseball America. Posey, 23, was rated the fourth-best overall prospect in baseball by MLB.com, and Bumgarner, 20, ranked 10th on the same list. Both were first-round draft picks, with Posey going fifth overall in 2008, and Bumgarner 10th in the 2007 first-year player draft. For a few short months they were a formidable battery led by former Major League catcher and San Francisco Giants player, Steve Decker who was entering his first season as skipper of the Grizzlies. Later during the 2010 season, Posey (who became the Giants’ starting catcher) and Bumgarner (now a mature 21 year-old World Series game winner) were called up to the “Show” and as they say, the rest is history. Both players had a huge impact on helping the San Francisco Giants win their first World Series championship since moving to San Francisco. During media day in April, at Chukchansi Park in Fresno, home of the Fresno Grizzlies, I had the opportunity to speak with Decker, Bumgarner and Posey about their health, fitness and training regimens.